There is so much potential for these unique and lovable creatures, and we are looking for the right partners to bring the adventure to every child. Unicorns continue to trend as a top toy in 2015, but Zoonicorns are on the rise. Entertainment branding/consulting companies, ThinkTank Emporium and All Art Licensing, are developing licensing and media opportunities based on this captivating property. 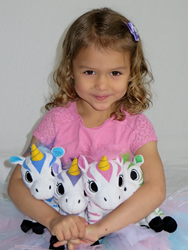 Zoonicorn launched as a plush toy and book series last year at Toy Fair, and with growing momentum, is announcing three additional book titles, mobile kid-friendly games and a completely new website in early 2016. Zoonicorn will be represented at Toy Fair Feb. 15-16, 2016. The Zoonicorn brand is a character-based family entertainment property for kids ages 3-8. Zoonicorn animals are a magical combination of zebra and unicorn. Zoonicorns come to children in the dreams of young animals. They join these animals in their dreams to help them feel safe and learn important lessons. There is a soft and cuddly Zoonicorn to match every type of child. The Zoonicorn family includes Valeo, the leader of the herd in blue; purple Promithea, who is fun and friendly; pink Aliel is fast and frenzied; and Ene, is green, playful and mischievous. Plush toys are $9.99 each. Customers can purchase all four characters and get the first book for $9.95 (a $7.00 savings). At retail in hard cover “Buffy Meets the Zoonicorns” is $16.95 and can be purchased on Amazon or on the Zoonicorn website, along with the plush toy animals. More than just a toy or a book, Zoonicorn, LLC is passionate about developing products that enrich the children’s lives in meaningful ways. The colorful Zoonicorn--a combination of a zebra and unicorn--visits young animals while they sleep and joins them on dreamland adventures. The dream play brings to the animals life lessons to help them through whatever might be troubling them. The Zoonicorns book series was launched February 2015 through Beaver’s Pond Press, Inc. It is written by Mark Lubratt, and illustrated by Sara Weingartner. Learn more at http://www.zoonicorn.com. Jeanette Smith, founder and President of All Art Marketing, is the Brand Manager and Licensing Agent for Zoonicorns, as well as for Dorothy’s Derby Chronicles, and Bodacious Broads. She is also the Official Blogger, Matchmaker and Host of the Resource Center for Artists, Designers, Brands and Agents at the Licensing Expo in Las Vegas. More than an agent for aspiring properties, Smith has coached, agented and trained artists, cartoonists, brands and properties to success for more than 10 years. Smith is best known for creating the DILBERT brand from its infancy, sky-rocketing it from a cartoon strip in 100 newspapers to a global corporate icon in more than 40 countries, 2000 newspapers and more than $200 million in annual retail sales, with television, books, with more than 750 licensed products. http://www.allartlicensing.com.